Each bag can hold 3300 pounds! The hoist is simply attached to the straps on the bag and the whole bag, contents and all, is lifted away. It's an amazing process! 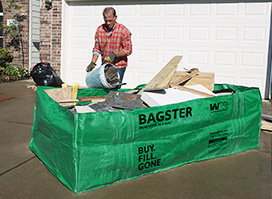 While I was filling this giant bagster bag, and especially when the waste company came to pick up the full bag, I noticed that as people drove by my house, some would look but not actually see what was going on. They simply failed to see the uniqueness of what was happening. 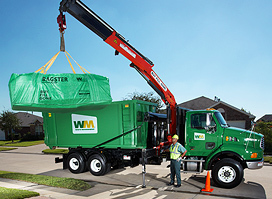 This was no ordinary trash disposal! Didn't what they saw happening here have any meaning to them? Could they not see how "beyond" ordinary trash bags this was? So, I found myself thinking "Most people look but don't see." Now that would be a brilliant observation if it were not already rather well known. Most people look but don't see. It's a factual statement, yet actually hard to understand. What does it mean, "people look but don't see?" How is it possible to not see what you are looking at? Of course, the meaning is that most people see but don't understand the significance of what they are seeing. Think of the phrase "See what I mean?" In English, the word "see" can mean both "to perceive with the eyes" but it also means "to understand." The phrase "See what I mean?" actually means "Do you understand now?" The Messiah understood this problem and He dealt with the problem by speaking in parables. The Messiah was asked by his disciples why he spoke in parables (Matthew 13:10). The Messiah responded "I speak in parables with them because they see, and they see not, and they hear and they do not hear, nor do they understand." (Matthew 13:13). This may not be readily understood at first, but what He means is this: Why should He speak to people clearly, explaining exactly what He means, when He expects people to make an effort to understand! Consider what He says to the disciples next: "But you [disciples], how blessed are your eyes, because they see, and your ears, because they hear! Yes indeed! I tell you that many a prophet and many a tzaddik longed to see the things you are seeing but did not see them, and to hear the things you are hearing but did not hear them" (Matthew 13:16-17). Recognize the importance of what the Messiah said! He had quoted part of Isaiah 6:9-10 which states: "And He said, 'Go, and you shall say to this people, 'Hearing, you hear, but do not understand; and seeing, you see, but do not know.' 'Make the heart of this people fat, and their ears heavy, and shut their eyes; lest they see with their eyes, and hear with their ears, and understand with their heart, and shall turn and be healed.'" Let's look at the words of Isaiah which Yeshua clearly understood. The heart of people had become fat (lazy), their ears heavy, their eyes shut! The people themselves lived lives that made them blind! If only they would turn their hearts and minds to YHWH, they would be healed and they would understand what they see and hear! This, the Messiah knew well! This is why he spoke in parables. 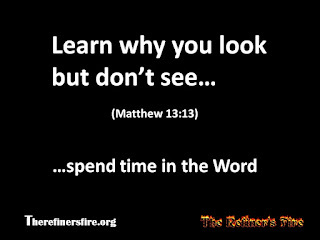 People have a responsibility to make an effort to turn from their earthly ways, turn from their ways of the flesh, turn from the trivial importance of the "event of the moment" so they can see and hear YHWH! Understanding won't be handed to them on a plate! It's not free! Seeing and hearing (understanding) requires effort. This is true of scripture as it is true in every day life. If you can't comprehend something unique when you see it or hear it, you have not made the effort! In the case of scripture, you have not studied the context or understood the background. In the case of everyday events, you have not relied on your education or you have emphasized trivialities over substance. For example: If you read an article about "the flat earth" or "chemtrails" and you are inclined to believe it, you have not applied what you should have learned in school to discern the false claims in the article. You didn't make the effort. You will have experienced the prophecy of Isaiah 6:9-10! You hear but you don't understand, you see but you don't know. This, indeed, is what it meant by a "fat heart"! Returning to my example of the unique trash bag system I was using called "bagster bags", the people who drove by clearly saw the bag being filled or loaded yet drove on past without so much as a "wow" expression. They were likely engrossed at the moment in their trivial task. They could not see because their eyes, heart, and mind were on something else. That "something else" was probably important to them only at that moment. Am I going to be on time? Is my dress okay? I wonder if John is at home? I must pick up the laundry today, etc. Whatever they were thinking or doing, it prevented them from seeing, and recognizing, something unique. They could have had a brief "wow" moment, experiencing something unique, but they missed it. I see the same thing happening to people when they encounter scripture. They could have a "wow" moment, but they did not make the effort. They look but they don't see. Thanks, Candido! You are one of the FEW people we have ever known who has grown tremendously - because you're constantly studying and learning! You are a wonderful servant!